Nestled in the Warp Disruption Field Generator tiericide post is a little gem. Focused heavy interdictor points will now scramble. They will turn off MJDs. They will turn off MWDs. That is the focused point. A common misconception on the forums is that the bubble will also scramble, that is not the case. You only get the scramble effect when you load the script and pick a single target. It is a massive change with just that. A Tech II scrambler right now reaches 9 km. Overheated you get 12 km, and overheated under bonuses you get 15 km. A Tech II hictor point will reach out to 37.5 km. The closest you can get to that right now is an overheated Lachesis with skirmish bonuses and a 100 mil ISK faction scrambler with 35 km of range. Hictors will not require bonuses or overheating. In the Lachesis, it can receive remote repair while tackling a target. It is worth mentioning that the Lachesis can almost fill the role the hictor is getting. Anything that the hictor will do to ruin the meta or break the game can theoretically already be achieved. What the Lachesis cannot do is sport solid DPS and tank numbers. The Lachesis doesn’t offer a selection of weapon systems or tanking choices. Hictors on the other hand, can fit rails, missiles, lasers, and projectiles at very nearly the DPS values of HACs, as well as coming with a 20 % resistance role bonus. You can easily fit a ship with over 100K EHP, 500 DPS, and a 37.5 km scrambler. And while they are not exactly fast, they can reach very respectable speeds for Tech II cruisers. I am saying that I think these will be very good for some styles of play. In fleet where these do a little worse than HACs at damage, and cannot receive remote repairs with the field active they may not shine. In small gang and solo situations that call for well rounded capabilities and where kiting and being able to fight against kiting are terribly important abilities, they are going to be incredible. Hictors will both be able to grab anything that comes into regular warp disruptor range, and they will be able to hold enemy ships off, far from regular scramble range. For example, imagine a Vagabond versus a Broadsword. This Vagabond, scrambled maybe 30 km off the Broadsword, will wriggle like a land-bound fish. A scrambler will be useless for the Vagabond because it will never get close enough, and a warp disruptor will not do much good either. To add to the insult, the Broadsword may have twice the EHP of the Vagabond, and only slightly less DPS. People have not been calling the Vagabond “cancer” in the small gang environment. That distinction has gone to the Orthrus. A more apt comparison may be the RLML Orthrus VS the RLML Onyx. To start, the Orthrus has 65K EHP and the Onxy has 125K. The post nerf Orthrus does 440 DPS and the Onyx does 420 with navy ammo. The Orthrus goes 2950 m/s and the Onxy goes 1750 m/s. The Onyx has a 39 km faction scrambler and the Orthrus has overheated a 70 km long faction point or a 26 km faction scrambler. 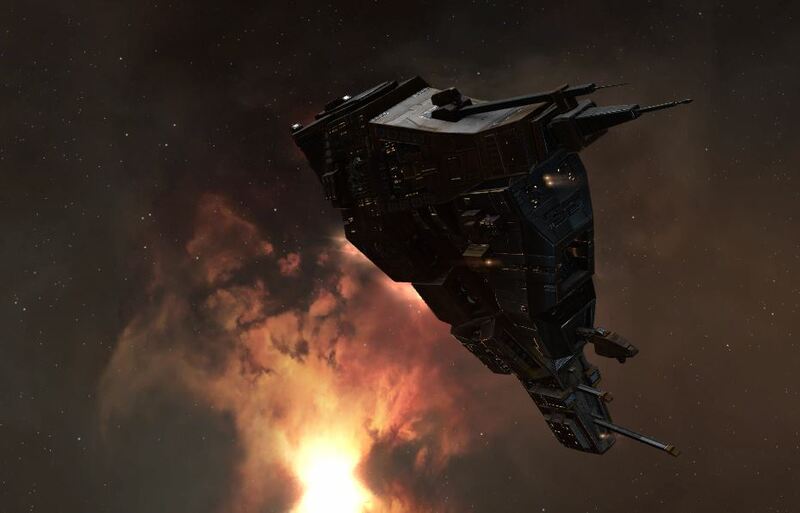 The Orthrus has a short cap life while the Onyx runs a cap booster. And hilariously, the Onyx passive tank is 310 DPS tanked to the Orthrus 140. This comparison is not quite so clear cut. A skilled Orthrus that started at an appropriate range could dodge an Onyx. The Onyx is very slow compared to the Orthrus. But they have the same weapon range, and the Onyx is going to beat the Orthrus in the DPS race at any range. If the Orthrus gets caught inside 40 km it is going to die. Fighting heavily outnumbered, the Orthrus will still do better with its ability to kite away very quickly, but the Onyx has a whole lot going for it, particularly when it is a member of the slightly larger fleet. Short range is going to take on a new meaning as these ships pick up in popularity. Scramble range and gate spawn range have traditionally defined short range as about 10-15 km. With this new scramble range, people are going to have to fit their ships with the idea that they may get stuck 35 km away from the guy they are trying to fight. Mid-range becomes short range. Short range becomes useless. You do not want to be the guy with blasters scrambled 30 km off the fight. Even autocannons barely qualify as useful, and only if they are on a hull with a falloff range bonus. I could even easily imagine two hictors having each other scrambled at 30 km apart and neither one would be able to close range or pull distance very quickly. Keep in mind that nothing stops someone from filling their highslots with fields, as long as they can handle the capacitor requirements. In a fleet setting, one hictor can grab a bunch of victims. Afterburners are going to be big next season. If you really want to end up 8 km away from your target, you may find that a lot of that ground is going to have to be covered while using an afterburner. Ships that get a bonus to afterburner performance are going to get a boost with more prevalent scrams. Tech 3 cruisers and the Sansha lineup will be pretty nice. This is a controversial addition with winners and losers. What we currently think of as mid range kiters are going to have a harder time of it. The meta is going to shift. And while I might make predictions, the reality is that we will not know exactly how things are going to shake out until we see them in practice. This is not an easy balance question like “Should we nerf the Ishtar?” This balance pass is not needed, although I suspect that it may be a part of the capital propulsion module question. Maybe CCP think we need a specialized ship for turning off capital MJDs? Maybe CCP plan to make capitals immune to the effects of regular scrams? In general I am happy to see the meta shift every so often just to keep things interesting. A stagnant meta is a boring meta to me.